The Michael Kors Access Sofie looks beautiful on the wrist, with a thin and sleek stainless steel strap and a fully-circular bedazzled touch screen display. 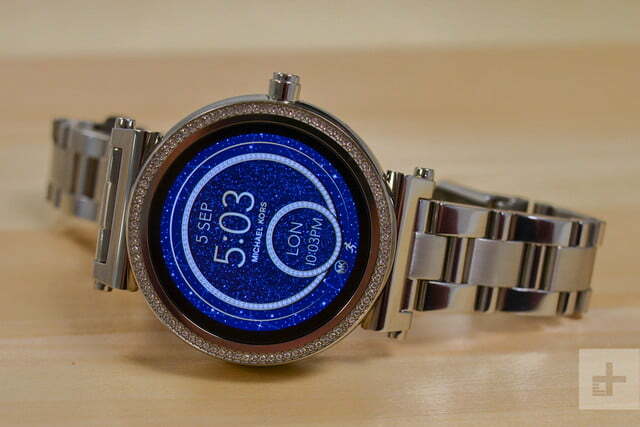 Michael Kors has a new smartwatch for women. 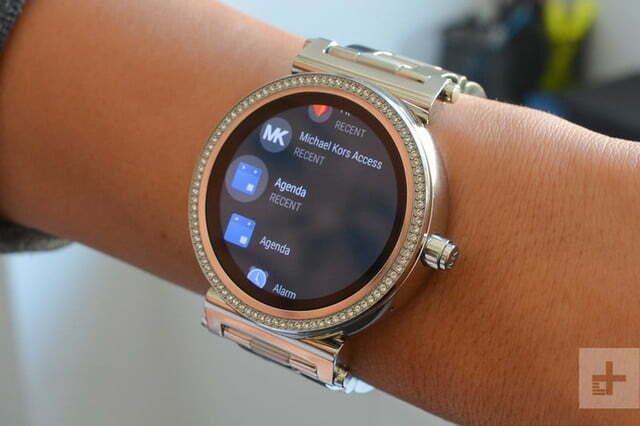 Like last year’s Access Bradshaw, the new Michael Kors Access Sofie also runs the Android Wear operating system. 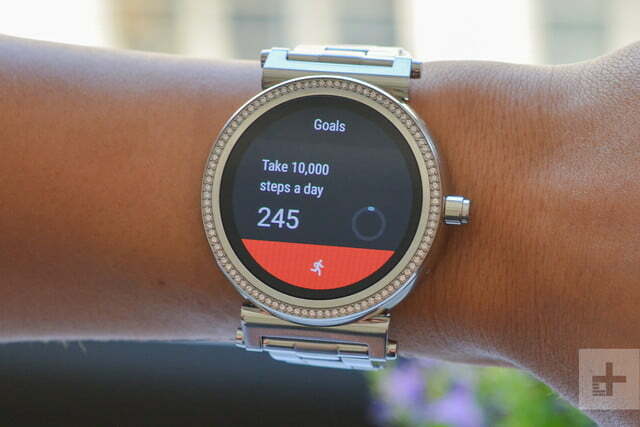 But the most notable improvements, aside from design, are the fully circular display, and a new version of Google’s Android Wear OS. The gemstone bezel, fully-round display, and stainless steel strap offer a luxurious and elegant look, making the Sofie stay true to the recognizable style of any Michael Kors watch. But it still has its flaws on the inside and outside. Let’s take a closer look. For those loyal to Michael Kors, you’ll notice the Access Sofie’s design doesn’t stray far from its signature style – pavé setting stones, where the gemstones are placed closely together. The Sofie is glitzy. The metallic design coupled with the gemstones are perhaps a little too eye-catching, and we would have preferred a slightly plainer aesthetic — like last year’s Bradshaw. The silver color helped make it look a little less out of place with toned down outfits, but there are even glitzier variants. The Sofie Pavé Gold-Tone, for example, has gemstones on the strap as well. If you do want something a little more subtle, the Sofie’s bands are easily interchangeable. If you love rocking the pavé look, the Sofie is a great choice. If you do want something a little more subtle, the Sofie’s bands are easily interchangeable so you can opt for a leather or mesh stainless steel strap. With our Silver-Tone review unit, we found it more fitting to wear it to upscale social events where it matched our outfit better, instead of using it as an everyday smartwatch when wearing a T-shirt and jeans. The watch is incredibly lightweight and isn’t bulky at all, but for comfort, your mileage may vary. It’s important to note, you will likely have to get the Sofie resized at a watch repair vendor, or for free at a Michael Kors store. Our stainless steel strap was too large, and needed all the links taken out to keep the watch snug and secure, but it was still a little too tight. If a link was added back on, it became a little too loose. There was no completely comfortable in-between option, but this completely depends on the size of your wrist. We recommend checking the watch out at a Michael Kors store near you. The Sofie only has one button, unlike the three on the men’s Michael Kors Access Grayson. This can be a little limiting, as the men’s smartwatch lets you add your own shortcuts to the top and bottom button; and the crown even rotates, allowing you to scroll through the Android Wear interface without swiping all over the place. The Sofie’s button opens a list of installed apps, such as the weather, contacts, and the Google Play Store, but you can press it hold it to access the Google Assistant (more on this later). Like nearly all Android Wear smartwatches, the Sofie is powered by Qualcomm’s Snapdragon Wear 2100 processor, with 512MB of RAM. We had zero issues with performance. Swiping through the interface felt fast and fluid, as did opening apps. There’s also 4GB of storage, so you can store music to the smartwatch and play it via Bluetooth-connected earbuds. The display resolution comes in at 390 x 390, which is fairly high for a 1.19-inch AMOLED screen. The screen is vivid, and gets bright enough to see outside. We would have liked to see a larger display, though, to not only house a bigger battery, but also to see notifications easier. 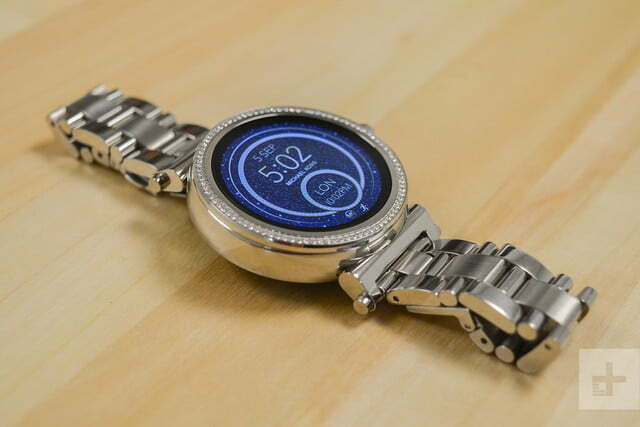 Android Wear is Google’s wearable operating system, and it’s incredibly simple to use. 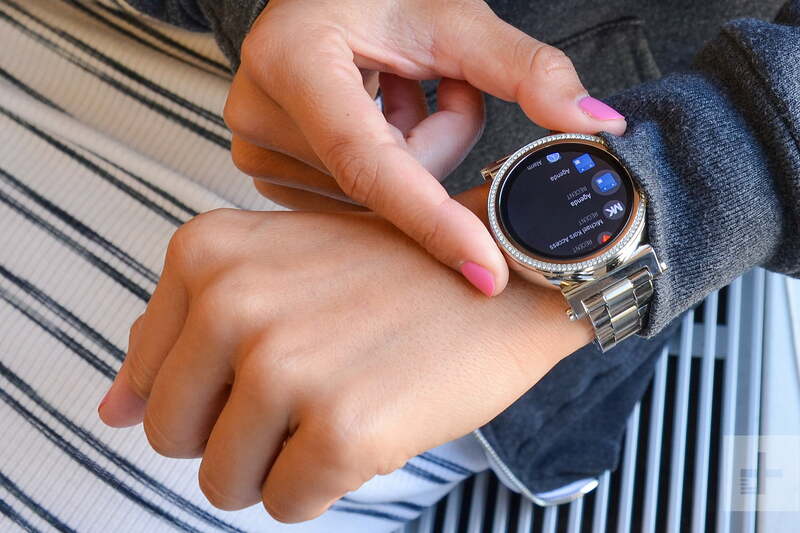 Swipe down from the main watch face to access the quick settings, and swipe up to view your notifications. Press the crown to see your installed apps, or access the Google Play Store. Google Assistant is also on board — it’s Google’s artificially intelligent assistant that perform functions for you, like sending a message, or relaying the weather. You can access the Assistant by pressing and holding the crown. iPhone users will be able to see almost all the notifications from your phone on the Sofie. The problem is you won’t be able to interact with most of them. One swipe to the right or left of the watch face lets you choose between other watch faces, and customize them. 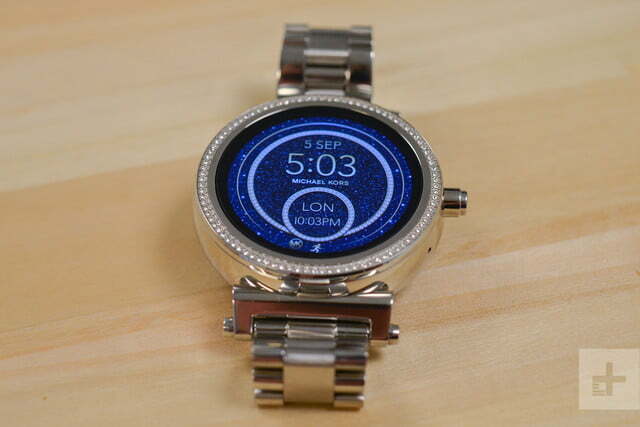 The pre-installed watch faces are a bit over-the-top on the Sofie, but they range from fancy to sporty. You can also add Complications to watch faces. These are dials on the watch face that act like widgets, offering information from an app at a glance. There are also a lot of ways you can reply to notifications: Voice input, scribbling letters, swiping or typing through the virtual keyboard. We prefer swiping with the keyboard, but the voice input can be handy (though we usually only use it when we’re alone in a public space or at home). Smart Replies are an option — they’re short, contextually relevant phrases you can choose to use as a response. While Android Wear is fairly standard across all devices, each smartwatch has its own unique feature in the form of micro apps. 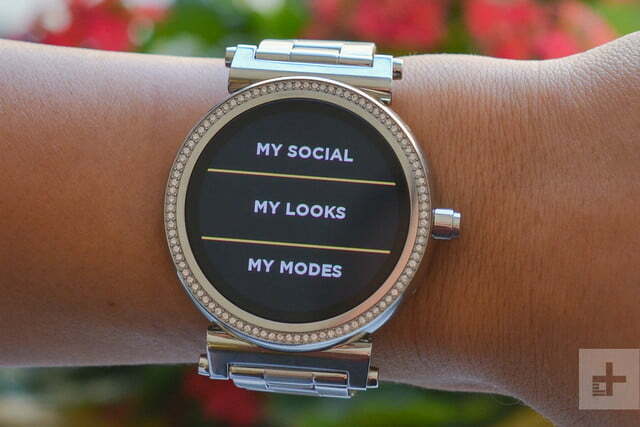 For Michael Kors, there are three micro apps: My Looks, My Social, and My Modes. My Modes lets you save your favorite watch faces and have them appear automatically at certain times throughout the day. For further customization, you can change the colors of the pre-set watch faces by color, whether it’s the hands or the background. The look will then save to the My Looks app. My Social links to your Instagram and Facebook accounts, and you can set photos from your account as watch faces. The Sofie is compatible with both iOS and Android devices. But for those opting to use an iPhone, expect limited uses. Like on Android, you’ll have to download the Android Wear app, but it will have to stay running in the background to make sure the Sofie is still connected. If you’re a frequent app closer, you won’t see notifications on your watch until you open the Android Wear app again and reconnect the watch. iPhone users will be able to see almost all the notifications from your phone on the Sofie. The problem is you won’t be able to interact with most of them. iMessage and SMS messages will show up on the watch, but there’s no way to reply. There are certain apps where the reply function does work, such as Gmail. What’s neat is iOS users can download apps from the Google Play Store on the watch itself. We installed Uber and found no issues, but while Facebook Messenger installed, we encountered an error message asking to have the app open on the phone as well. It already was. We didn’t have this issue when we paired the Sofie with an Android phone. Other apps that work for iOS are Gmail, Google Calendar, and the Google app. If you have them installed on your iPhone, you’ll also be able to receive reminders and set alarms. The Sofie does include built-in fitness tracking via Google Fit, allowing you to view how many calories you burned, steps you’ve taken, and the distance traveled. But as far as exercise goes, that’s the extent of it — there’s no heart rate monitor or GPS. Thankfully, the smartwatch is IP67 water- and dust-resistant, meaning you can take it underwater up to 1 meter for 30 minutes. The Sofie includes a 300mAh battery with a wireless charging puck that connects magnetically to the smartwatch. Michael Kors claims the Sofie has a 24 hour battery, and we generally found that to be the case. On a full charge, the Sofie lasted an entire day with almost 40 percent left towards the end. If you forget to put it on the charger overnight, you may be able to squeeze a few more hours out of it into the morning. To be fair, we used the Sofie with an iPhone — using it to see our notifications, and track our steps. You may see decreased battery life on Android if you use the Sofie to its full capabilities. 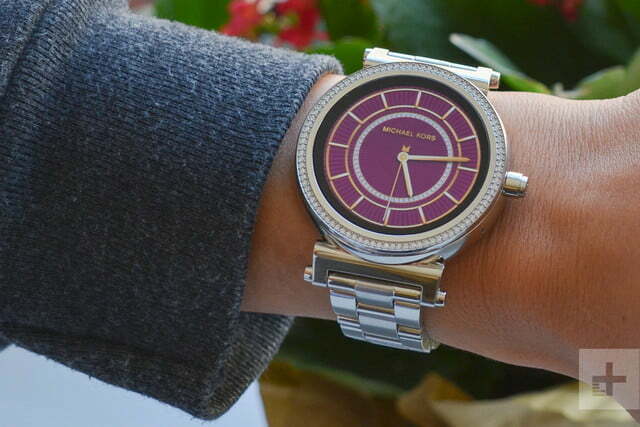 The Michael Kors Access Sofie smartwatch starts at $350 and can go up all the way to $495. It’s pricey, but it’s not as expensive as smartwatches offered by other fashion brands. For this price, you’re not getting features you’d find on an Android Wear smartwatch built by a smartphone manufacturer, such as Android Pay or GPS. The watch also comes with a limited two-year warranty for manufacturer defects. The Michael Kors Access Sofie looks beautiful on the wrist, with a thin and sleek stainless steel strap and a fully-circular bedazzled touch screen display. There are quite a few designs available so you can style it how your want, though you’ll always have the pavé set stone design. If you’re not a fan of that style, you may want to look elsewhere. Yes. If you’re looking for a watch that’s still stylish and also simple as far as software goes, the Misfit Vapor is a great option for women. In terms of specs, it includes the same Qualcomm Snapdragon Wear 2100 chip and 4GB of storage. It also has a fully circular AMOLED display that’s bigger, coming in at 1.39-inches. It’s slim, and comes with a strap that fits slimmer wrists without having to make major adjustments. With a $200 price tag, you’re getting many of the same features and functionality as the Sofie, but at half the price. If you’re looking for a more feature-rich smartwatch check out the Huawei Watch 2; and for iPhone users, we recommend the Apple Watch Series 2 (though Series 3 is on the way). If we’re talking aesthetics, the Sofie smartwatch will most likely be able to last beyond the two-year limited warranty. The classic style, interchangeable straps, and IP67 rating could have you holding on to this smartwatch for a while. You may not see software updates after the two year mark though, and the battery of the watch will degrade over time. Yes, If you’re in the market for a smartwatch with Android Wear that’s on-trend with today’s fashion, then the Michael Kors Access Sofie watch is a great option.